Winter waves sculpt ever-evolving ice formations. Giggles of children tumbling down the dune climb, juicy blueberries, toasty campfires, the surge of endorphins induced by cross-country skiing, views of golden dunes that perch over sapphire Lake Michigan or of blue-gray ice sheets that hem in the lake's shoreline - this is Sleeping Bear Dunes National Lakeshore. Visit in any season and be immersed in a landscape of delights. Winter, for example, presents visitors with a quiet and rarely seen landscape. Waves lap on the beaches. Streams swirl and bubble beneath crystalline skins of ice. Snow fills in the crooks of trees and caps the tall grasses. The Lakeshore offers easy, intermediate, and advanced cross-country trails for skiing, as well as opportunities to fish in inland lakes. In addition, you can explore the beaches, where snow and ice often create caves and other fascinating formations, and walk softly, wearing snowshoes, through white-clad fields and forests. 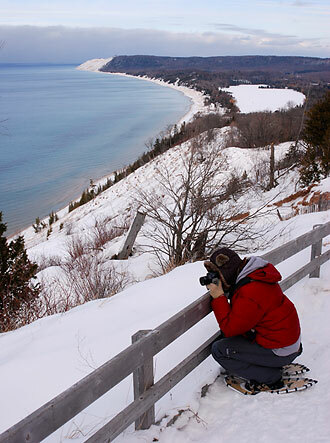 A park ranger can reveal winter beauty at Sleeping Bear Dunes on a ranger-led snowshoe hike. 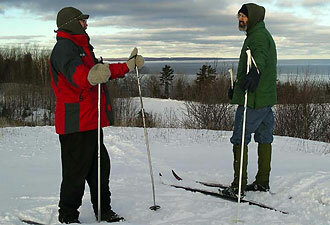 Snowshoeing affords good exercise and can be enjoyed by people of all ages and degrees of experience. Every Saturday and Sunday in January and February, appropriately bundled visitors follow a ranger down a snowy trail, identifying flora and fauna and learning the Lakeshore's history. The hikes proceed at a leisurely pace for only 0.5 – 1.5 miles, in a different location each week. If you don't have your own snowshoes, the Lakeshore has loaners you may reserve and use free of charge. Even when the towering dunes along Lake Michigan and the quiet country roads of Port Oneida aren't covered in snow, they offer plenty of sights, discoveries, and adventures. In warmer months, visitors shiver through the first splash into Lake Michigan after a hot hike through the dunes. The ethereal calls of migrating sandhill cranes sound from overhead. You may hear the hammering of a pileated woodpecker or spy a scarlet tanager against green leaves and pine needles. At the overlooks of Lake Michigan on the Pierce Stocking Scenic Drive, life, sand, wind, and water fill a gazer's every pore. Look into the past as well as into nature at the Lakeshore. Peek in the open doors of a large red barn in Port Oneida, under the “witch's hat” roof of the gleaming white U.S. Life Saving Service Station, or through the multi-paned windows of the Glen Haven General Store. Listen as the blacksmith's hammer clangs sharply on the anvil. Stroll or bike through old farmsteads and logging camps, and feel the connections of community, land, and water. Retreat even further into the wilderness and see cedars on South Manitou Island older than Christopher Columbus and glacial formations more ancient than the pyramids. Find trails to hike and launch areas from which to fly. Maybe you'll glimpse a a beaver eating a twig the way you eat corn-on-the-cob, or a piping plover hiding her young in her feathers. Sleeping Bear Dunes National Lakeshore is just one of nearly 400 places Americans have set aside as part of the National Park System to preserve our natural and cultural heritage. The national parks belong to all Americans. 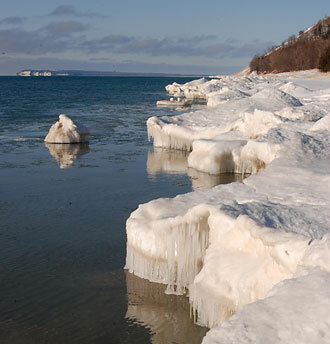 Start (or continue) enjoying them with a trip to Sleeping Bear Dunes.